Our puppy, Axel is a Vizsla mix. We have no idea so far how much Vizsla he has in his family history or what other breed he might be mixed with. 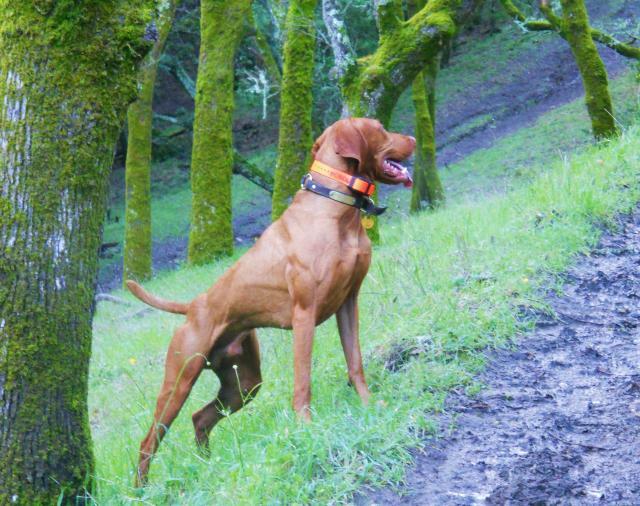 So far, though, his looks and characteristics are very consistent with a typical Vizsla. Because we don't know what breed he is mixed with and don't have any friends with Vizslas, we aren't sure if he is the typical size and weight of a V his age. Do any of you know a website to find average sizes at different ages or happen to know what size and weight a 5 month old Vizsla typically is? If you go by the above graph of how a Vizsla ages, it will give you some indication where he is in the growth stage. I have know 45 pound full grown Vizslas and 85 pound full grown Vizslas. These are outside the standard, but they are out there. When you mix ??? then? The standard for males is about 23 to 25 inches and weight is relative to height. Bailey, our make is 24 inches at the shoulders and 62 pounds. Many others are lighter boned and weigh in at around 55. Most Vizslas are fully grown at about 18 months. Hope that was useful for you. Don't know if this helps, but I have tracked Bodhi's weight over the last two years. At least it will give you a reference point from one male vizsla who is approximately 24.5" at the withers and 55 lbs at 2.25 years old. You can see pictures of Bodhi in his Blog (see URL in signature) for a visual comparison. Thanks for the chart. I consulted it frequently as my pup Dax grew up. He was always just a pound or two less than your dog. Interestingly, if you look at the chart, the data points between 7.5 and 9 months hover around 50#. After that Bohdi had a growth spurt, but Dax remained at that weight. He is now 14 months old and 51#. Originally I had wanted him to be larger, but that was before I discovered that V's are inveterate lap dogs, so now I'm glad he didn't get any bigger. THANKS FOR THE CHART BODHI (WHAT A GREAT IDEA BTW, WISH WE THOUGHT OF THAT), WE HAVE A 6 MONTH OLD V AND WERE CURIOUS OURSELVES ABOUT HIS DEVELOPMENT AND WHERE HE STOOD COMPARED TO OTHERS. My dog Jasper is a 2 1/2 year old male and weighs 54 pounds. he has been that weight for the last year. Compared to the other V's he hunts with he seems to be a bit on the small side but since he spends a fair amount of time on our laps, that's OK.
My Mac just had his 10 week vet appointment and he is 20 pounds! The vet said he is a healthy boy and not over weight. You can see his ribs. He just has a very big chest and front legs. I have a feeling I am going to have a big boy. From the comments made above I also have a feeling that I am going to have a sore lap. I swear I have the smallest pup on this forum. Ruby continues to be the runt. I think she is 35lbs at 6 1/2 months. I need to measure her but she is seems so small. I am hoping for another growth spurt coming up again. I wanted her to be small but not this small. Jasper is just two days over 6 months, and he weighs 36lbs. He's a touch on the small side, so I'll be pretty impressed if he gets any bigger than 50lbs. I haven't measured how tall he is--maybe I'll do that tonight if I can get him to stay still long enough to read the tape!